Highlights this month: innovation, charities doing great at digital, responsible tech, #GBSpringClean, The Samaritans new website, representation in images and comms. Don’t let Brexit misery drag you down. Get outside for a nice walk in the sunshine, have an ice cream, then settle back to catch up on this month’s good reads and great content. The Wildlife Trusts update the story of Wind in the Willows with an all-star cast and serious messages. Beautiful photos and stories from War Child for #InternationalDayOfHappiness. The Makaton Charity signed Julia Donaldson’s Snail and the Whale for World Book Day. Super cool video raising awareness of sugar in sikh communities for Cities Diabetes. What do you call yours? Heath campaign from Public Health Wales. See also #Pads4Dads from Hey Girls. How to tweet about the #GBSpringClean in a non-boring way – see Doncaster Council, Sisters Against Plastic, The Little Collector of Wirral (who is 8 and knows about a good before and after picture) and this nice thank you from Harlow Council. Everyone else is sharing pics of groups of people wearing high vis and piles of bin bags. There’s lots to get your teeth into in this impressive new guide from Charity Comms about innovation. ‘Innovation is for everyone’. It includes lots of examples and useful resources. There’s was more in their recent seminar about the innovation mindset. Slides from the event are available, tweets coming soon. Website photography: a picture paints a thousand words – I wish I had written this but The Digital Dunk did it. How does the diversity of the photos you use measure up? Audience insights on a budget – Sarah Fitzgerald for Charity Comms. I went to Raw London’s event on using customer experience to transform your charity comms. Do read the summary and the slides. Starting a podcast: what’s it all about? Beth Crackles for UK Fundraising. Also How the Guardian is making podcasts pay off. Framing toolkit: Talking about poverty – JRF. Catch up with Lightful’s monthly social media round-up. New guide from Social Misfits Media – Make it Social (see under publications). What 777,367,063 Facebook posts tell us about successful content in 2019 – buffer. Got complex data to present? How about an animated bar chart showing change? I love this example of the changing list of the 10 world cities since 1500. New website and brand from Samaritans. The website includes a dynamic homepage with different content after 9pm. This Charity Comms article explores the reason behind the rebrand. And this presentation from Mike Keating explains how they refined their digital purpose as part of the project and (accidentally) produced a content strategy. Can failed prototyping help charities improve digital service design? – Freddie Herzog for Charity Comms. Getting technical — starting to develop an architecture and roadmap for NCVO’s future technology – Megan Griffith Gray’s next blog post about NCVO’s digital development. Why you only need to test with 5 users – Nielson Norman Group. The dangers of overpersonalization – Nielson Norman Group. It’s time to think about our data as a common good – Theo Bass of NESTA for British Council. Interesting article looking at the value of personal information in shaping the future. Digital freedom: are your rights at risk? – RightsInfo. How much of the internet is fake? – New York magazine. Also see a click farm in action and interesting discussions in response. Lots to read in this post sharing discussions and outcomes from DotEveryone’s Responsible Tech 2019 event. Britain’s bullied chatbots fight back – BBC News. Citizens Advice have built a chatbot for staff. CLIC Sargent share the impact of live chat. 10 ways to make your charity genuinely digital – NPC. Why World Vision is thinking beyond the technology – Martin Campbell for Civil Society. Planning in an agile organisation – McKinsey. How to get people talking about digital. I like this digital takeaways guide from SCVO. Third Sector Digital Leaders – the future of work webinar. 44min video featuring Rhodri Davies, Head of Policy at CAF. 10 reasons you still need a digital team – Smart Insights. Monthly accessibility tip: these name badges from an accessibility conference are a great example of why using meaningful link text is important! Plus RNIB got a mention on the Channel4’s Last Leg about capitalising words in hashtags. Interested in digital skills and inclusion? Useful thread of tweets from One Digital’s making digital accessible for everyone event by James Beecher. Free digital skills courses from Future Learn. 12 highly effective SEO tips for noprofits – Tom Crowe. 3 real-world SEO examples: the pages, the phrases and the results – Orbit Media Studios. Here are the winners of this years DigitalAgenda Impact Awards. Philanthropy and digital civil society: blueprint 2019 – a view from Stanford PACS in the US. The world wide web was 30 this month. 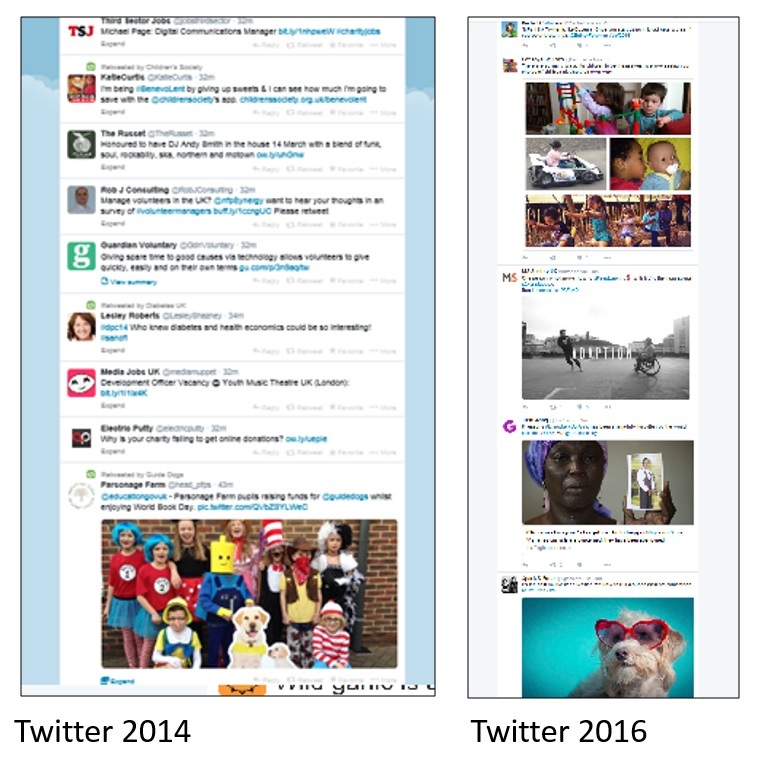 I looked at how the charity web has changed through the evolution of the British Red Cross website. The Web Foundation curated a timeline of developments over the 30 years. See also this thread of interesting reads from Rhodri Davies about the impact of the internet on charities and where next. And posts from James Mullarkey about responsible tech at work and home. Exploring different ways to give to charity – James Brennan for Civil Society. Are you speaking the same language as your donors? Simon Scriver shares tips on using plain English to communicate with the people who support you. But RIP Just Text Giving which closed on 31 March. Charity Digital News have produced this handy guide to alternative text donation services. Richard Herring’s International Women’s Day campaign for Refuge this year raised £129k. IoF playlist for last minute nominations for the IoFawards. There was lots written about Comic Relief this month. Here’s a selection – White Saviours Don’t Work (Good Agency) and Mandy Johnson – have Comic Relief got this one wrong? After the recent #TowelsForOwls fundraising appeal, see #ShredsForBeds and #WandsForWabbits. Building resilience and sustainability – tips for charity leaders – The Kings Fund. 11 practical steps towards healthy power dynamics at work – by Richard D. Bartlett. Call out everyday sexism in the workplace with Matthew Sherrington’s handy bingo card. Are your recruitment processes accessible? Have you made reasonable adjustments in your workplace to support people with disabilities? As part of the Governments’s Disability Confident Programme, RNIB shared some of their DCP resources for employers. Sounddelivery produced a series about leaders with lived experience for Third Sector. The articles are now behind the subscription-wall. But here is a lovely thread profiling them all and linking to their crowdfunder for the Being the Story network. Why climate destruction must be a priority for charities – Russell Benson in Civil Society. Who is the most famous person who went to your school? Some great replies to this Twitter question. Have you ever done an audit of the gender bias in the books your children are reading? How gender stereotypes in children’s books shape career choices – RSA. Am in awe of these spliced videos by Politics Joe – May Straight Otta the Commons. Did you miss February’s round-up? Catch up with more good reads! I have been watching the spread of the #firstfiver campaign since it started just under two weeks ago. It has been great to see how many organisations have joined in with this very simple idea. Unlike other viral fundraisers (such as #nomakeupselfie which I have blogged about before) this was not connected to a particular cause. It also didn’t feature a complicated or strenuous ask (such as the Ice Bucket Challenge or the current #22PushUpChallenge). Instead it was simple and easy to ask. And simple and easy for supporters to join in with. If you haven’t come across it yet, look at my storify showing the spread of the campaign and how different charities have responded. It includes examples from small charities such as Trinity Hosice, Harrogate Easier Living Project (HELP), The UK Sepsis Trust, Freedom from Torture and Make Lunch. And large ones including War Child UK, the Children’s Society and Sue Ryder. Images, videos, thank yous and shopping lists showing the difference a £5 donation could make, all help to make a request stand out. If your organisation hasn’t joined in yet, it is not too late. 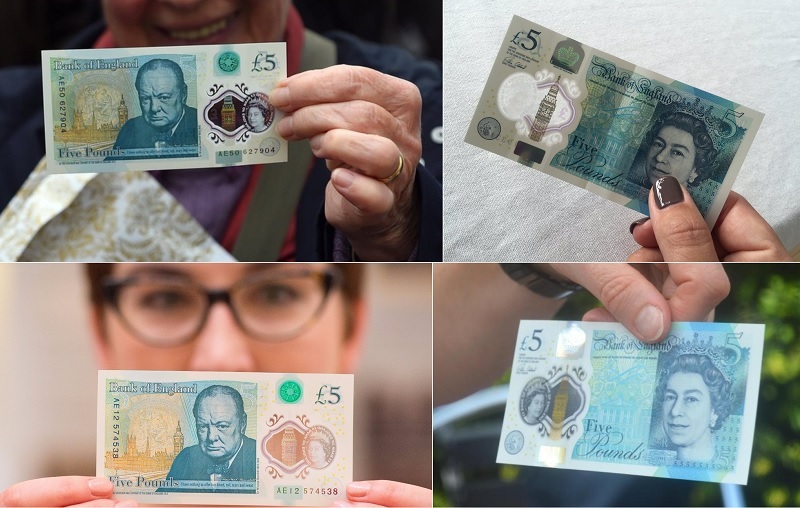 The hashtag is still going strong and many people still haven’t had a new £5 note yet. Have you seen any good examples that I have missed? Any particularly humourous or creative or persuasive posts? Has your organisation had (m)any donations? How easy was it for your organisation to join in with this campaign? Have you made a donation yourself? Please do comment, I’d love to hear from you.